“smooth” area can be observed throughout most of the image. SPI Supplies molybdenum disulfide (MoS2) provides a high quality layered material for the research and development field. The naturally occurring molybdenite crystals show excellent cleavage planes and compliment the other substrate materials useful for SPM studies and already offered by SPI Supplies: SPI Supplies® Brand fine mica and SPI Supplies Brand of HOPG (Highly Ordered Pyrolytic Graphite). Who would want to use MoS2? A growing number of users of STM and AFM are finding this to be the substrate of choice for looking at organic molecules, which bind nicely to MoS2. We are talking about binding properties that are far greater than for either mica or HOPG. Thin layers of molybdenum disulfide also have interesting electrical properties see, for example, B. Radisavljevic, A. Radenovic, V. Giacometti and A. Kis, Nature Nanotechnology, Volume 6, March 2011, pp. 147 to 150. This is a 100% "natural" material, it is taken out of the ground and in most instances, it is ground up into a fine powder to be used for its well documented lubrication properties. It is much more of a challenge to find MoS2 in sufficiently large crystal form that it can be used as a substrate material. MoS2 exhibits a lamellar or layer-like structure, with inter-lamellar bonding between two adjacent layers of sulfur atoms. Van der Waals forces between the layers is quite weak, meaning that the layers are easily pulled apart, just as is the case for mica. This is also the enabling feature that makes possible the property of "micaceous cleavage". The thermal stability of MoS2 in non-oxidizing environments is approximately of the order of 1100° C, but in air, oxidation starts to become appreciable at roughly 350 - 400°C. The normal air oxidation product is MoO3. Where does MoS2 come from? The two main deposits in the world are in Australia and Canada. The SPI MoS2 is collected by a professional geologist. Each molybdenite single crystal that is sold by SPI Supplies has been individual inspected and graded and only those passing the test of optical clarity and dimensions as well as aesthetic appearance are selected and packaged into special boxes with double cushion and padding. What are the physical characteristics? The SPI MoS2 "cleaves" in a way that is quite analogous to the cleaving of either "fine mica" or HOPG. 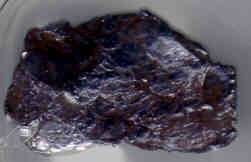 Hence for the researcher, it is fairly easy to obtain a freshly cleaved surface for critical samples and research. SPI Supplies furnishes extensive additional characterization of the MoS2 offered for these applications. MoS2 is insoluble in dilute acids and concentrated H2SO4. What do the cleavings look like? Actually, they are obtained very much like the way one would obtain cleavings from HOPG: With a piece of 3M® Brand "Magic" adhesive tape just press firmly onto the MoS2 the tape, and then with one smooth and continuous "pull", lift off the "cleaving" or "cleaved layer." The photo demonstration is actually a worst case example and represents what one would obtain from their first cleaving of the originally rough surface. Further cleavings will result in a somewhat larger cleaved surface area. Just what kind of phenomenon is this? Well, in some respects it is very analogous to the cleavage of mica and in other respects, it is more like the cleaving of HOPG. 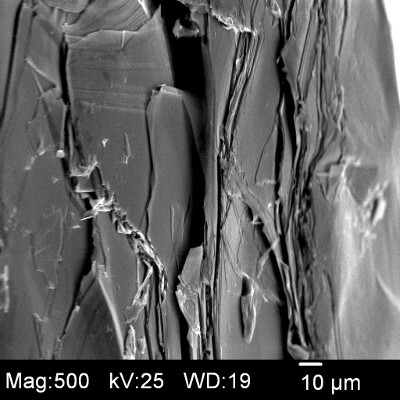 It is analogous to the cleaving of mica in the sense that there is nice "basal plane cleavage". 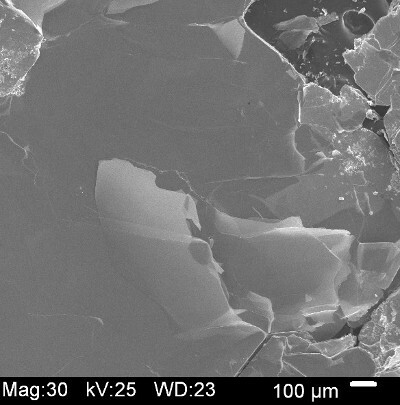 However, the regularity and size of the MoS2 crystals are much less than typically even for a low-grade mica so the user should not have unrealistic expectations in this respect. It is analogous to HOPG in the way the freshly cleaved surface is made, namely with the use of a tape stripping procedure. What kind of characterization work has been done on the SPI MoS2? Being a natural product, and also, given the well known way properties and characteristics can vary from point to point, we can only report the results of analyses done on what would appear to be similar samples, but not necessary the exact pieces available for purchase. By EDS, the only peaks seen are from the MoL and SKα We have done this kind of analysis on some number of these "pieces" or "sheafs" but we can not guarantee that the specific piece(s) a customer would be receiving would have that same composition. Based on our data so far, we have confidence that the purity is better than 99+%. And because of the natural origins of the SPI MoS2, no two pieces are going to be exactly the same size. Hence we offer the material in pieces that are "large", "medium" and "small" with minimum size specifications on each. Each piece of the SPI molybdenum disulfide is packed in an individual container for long-term storage and safekeeping. Note that the dimensions given below are minimum dimensions and in general, the crystal you receive will be larger than the minimum stated dimensions.